Watch Hollywood superstar Eddie Redmayne chat to Bex in The Club about Early Man! 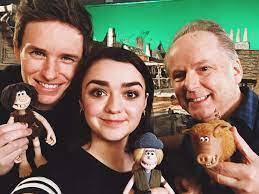 Eddie's the star of the new Aardman movie! Hollywood superstar Eddie Redmayne joined Bex in The Club on Fun Kids! He’s the voice of a caveman called Dug in Aardman’s new animated movie Early Man, which is out in cinemas now! Early Man is set at the dawn of time, when prehistoric creatures and woolly mammoths roamed the earth, and tells the story of Dug who has to unite his tribe against a mighty enemy – Lord Nooth and his Bronze Age City! Eddie told us more about creating the voices in the film – and they played a game of ‘football or foot-lol’! Then on Thursday, Bex’s special guest was the movie’s director (and Aardman founder) Nick Park, who shared the secrets behind making a whole movie out of plasticine! Watch Nick Park chat to Bex!